The six episodes to appear on Netflix are written, directed and produced by the Coen brothers and feature Timothy Blake Nelson as Scruggs. Nelson has appeared in a Coen brothers film before as Delmar O'Donnell in O Brother, Where Are Thou? "The whole reason it fell into our lap was they were looking for wide open country where you couldn't see fences or modern stuff," said Chris Laucomer, the fourth-generation rancher on FX Bar Ranch. "They contacted some gal from Scottsbluff and got a relative of ours who called my dad. A guy who looks for scenery of all this stuff came out and took pictures. He came out and the Coen brothers came out and looked and decided they would do some of it here." As artists, the Coen brothers and their crew have a very clear vision. The Laucomers' cows won't be in the film and even though they have a prairie-dog town available, which will be part of the episode, it won't be needed. Holes have been dug manually and prairie dogs will be digitally added. "They got real specific of where they'd shoot. I rode horseback in the hills for them. They have an Indian battle and wagons, so dad rode for them one day," Laucomer said. "Then they disappeared for a week, then brought back a load of people — cinematographers and gardeners. They're going to put specific plants in each shot, and they've got wranglers that have horses that know how to fall and about 20 wagons. It's quite an undertaking. They're going to be here all of two weeks." 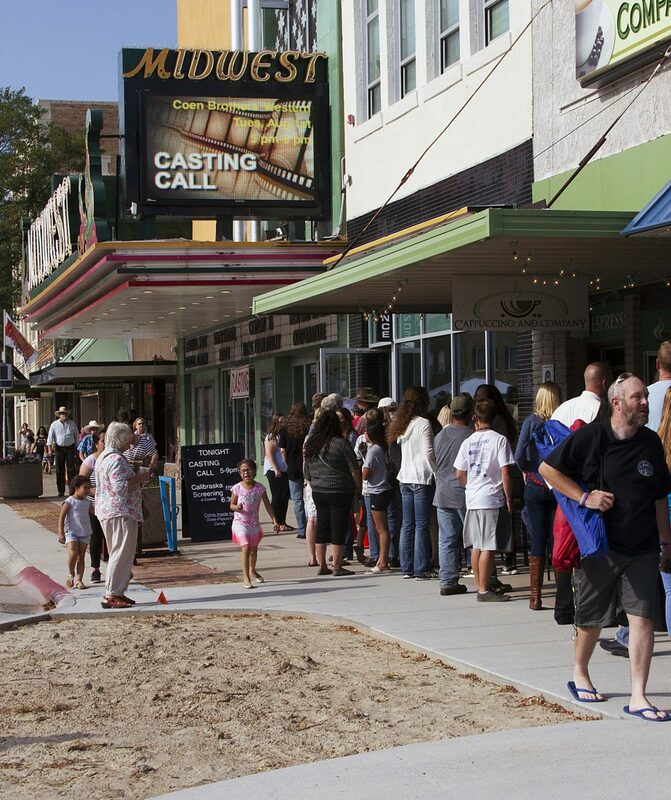 Auditions for extras were Aug. 1 at the historic Midwest Theater in Scottsbluff. "Actually 1,400 turned out that evening, which is unheard of for Scottsbluff, which doesn't have that opportunity very often, if ever," said Midwest Theater's executive director Billy Estes. "To have that kind of turnout is amazing. When and how often does a rural community have an opportunity to work with award-winning brothers? People are going to support it." An estimated 800 of the 1,400 actually auditioned. Mitchell, Neb., resident Tyler Plasencio auditioned as an extra, which mainly involved being asked how long it would take for his hair to reach the appropriate length. "It was hardly an audition. We stood in line for a long time, then we all signed cards, and gave our names, where we were from, if we had any dancing or violinist experience. Then two ladies took our pictures with their phones," Plasencio said. "They told me my hair was too short, and asked me how long it will take to grow my hair out, then they gave me their card. I had to cut my hair and shave my beard for drill in the Army Reserve recently, so I won't be calling back. They're going for looks; those with the right hair color and beard length probably got a call back." Laucomer didn't audition, though two of his kids, Marly and Jordy, auditioned, which resulted in Jordy landing a speaking part. "Six boys were selected as extras. One of those was Jordy," Cary Laucomer, Chris' wife, said. "They were all called in to audition before the Coen Brothers for a speaking part and he got it. It was an awesome experience for him. He even got to work with a stunt coordinator to prepare for his scene." As someone with a history degree and a fan in general of the Coen brother's prior work, Plasencio is looking forward to watching the miniseries. "I think it's pretty neat they're filming here. It's neat our area gets some recognition," he said. "When most people come to Nebraska, I think they miss some scenic areas when they don't come here. I'm glad someone is giving it the exposure it deserves." Most ranchers don't expect to ever host a film crew in their lifetimes, but the Laucomers have enjoyed the experience. "The family has enjoyed seeing what goes on behind the scenes. The props, equipment, and animals being stored at the ranch are so interesting and fun to see, We have met people from all over with a plethora of roles, from wranglers, animal trainers, stunt coordinators, and snake wranglers to the expected hair and makeup people, set people, cameramen," Cary said. "They are so friendly and have such interesting stories about their past jobs. Everyone is so grateful for the use of the land and truly appreciate the beauty of the country that we often take for granted." The Ballad of Buster Scruggs will premiere on Netflix in 2018.